Letter A, "Letter A ~ I Spy Beginning Sounds Activities"
In this resource set you will receive four worksheets, a letter 'A' printable poster and a printable board game with instructions. These single sound differentiated activities are great for literacy centers/and or for independent practice. 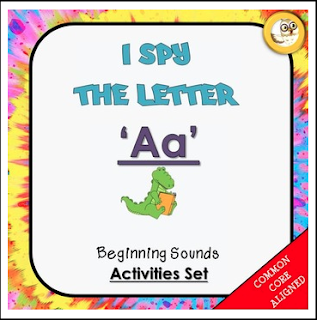 The skills focused in these activities are recognizing and identifying the letter 'A', learning the sound of words that begin with the letter 'A', and identifying things that begin with the letter 'A'. Save $10! by purchasing this Alphabet I Spy Activities Super Bundle instead of buying individually. Worksheet 1: Picture Hunt - Students will need to hunt for items that begin with the letter A in a jumbled picture maze. Worksheet 2: Cut and Paste Letter A Things - Students will need to cut and paste the items that begin with the letter A, and put crosses through items that do not begin with the letter A. Worksheet 3: Find Big 'A' and Little 'a' - amongst jumbled alphabet letters, students will need to seek out big 'A' and little 'a' and count how many of each they find. Worksheet 4: Students cut out the letter 'A' pieces and paste them in front of each 'A' word on the sheet. Don't forget to rate us for credit points and follow us for updates and new products!!!!!! OR you can save $10 by purchasing the Alphabet I Spy Activities Super Bundle (A-Z) and get the entire set!